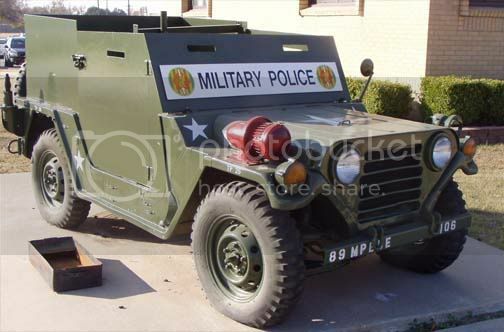 I've seen pics of gun jeeps - some for Military Police and some for supply column protection. Does anyone have any details or specs. for the panels - doors, windshield, etc..?? Also, some looked like they had two m60 mounts on the rear fenders - does anyone have some pics of the interior that might show some mounting details?? 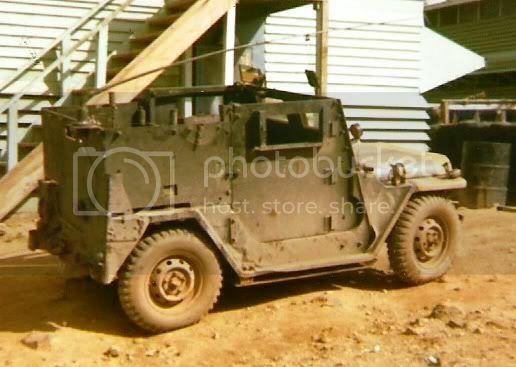 I've seen quite a few "uber" equipped M151s out there, but never a gun jeep. Might be interesting to build one. Any info would be appreciated !! Thanks for the cool pics !!! Note the mine protection plates on the underside of the two bottom pictures. Didn't notice those before. 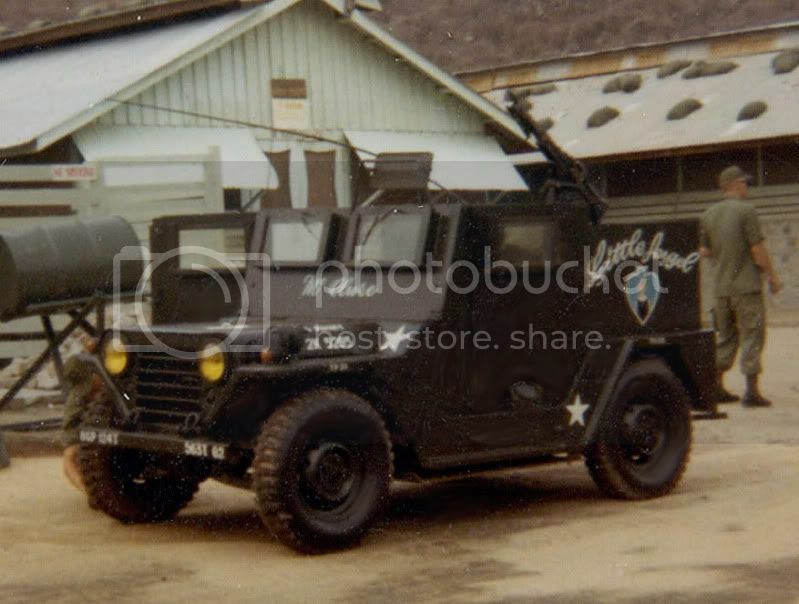 When I get my M37 back out here from Wisconsin (and buy it back from my brother ) I want to do an M37 guntruck out of it. Should be an interesting project. If anyone has any M37 guntruck pics, that would be great. I already harvested all the ones in your great pic collection album, Ralph! General know it all jerk 42 years and running. I think the mine protection plates were more of a psychological aid than they were functional. Dear Guys, I am new to this forum. I just got original armor kit from Utha from Tomlin ordonance depot. Poor friend Jack died few days after shipping me the kit. all mounting hardware wich includes reinforcement and doors steel beams with lach. I will include pictures soon I did assebly it it is not finished yet. Welcome aboard Gibbo. Looking forward to see your armoured MUTT. Just so you know, There was no "original" armor kit for the V/N era vehicles. These were all field modifications. Unapproved in the official military books at that. Very successful in the real world though. As a case in point about military incompetence there were a couple of cases in the first gulf war where GI's did the same thing to the hummers. They were court martialed for making unapproved modifications to a vehicle. I think those cases were reversed after many years of wrangling when the military realized people were getting killed by IED's. DUH! that's what you think ! Remember that old addage..."Never Say Never"??? Here's one of several photos that Gibbo sent me a while ago. I sent these photos to US ARMY TACOM to see if they could provide further information, documentation etc for Gibbo....unfortunately, they have not yet replied. Well Ken you may have me but those kits were not used in Vietnam were they? I am thinking much, much later. I can say I have never heard of it, is there a MWO? 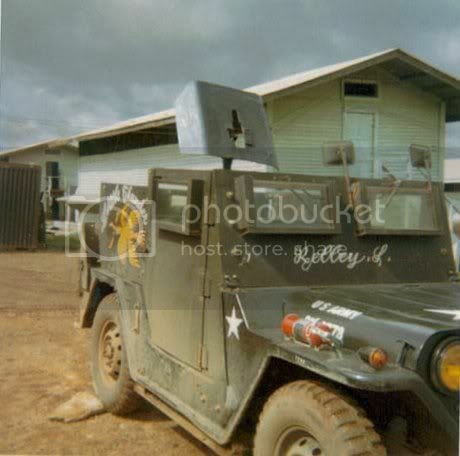 rickf wrote: Well Ken you may have me but those kits were not used in Vietnam were they? I am thinking much, much later. I can say I have never heard of it, is there a MWO? the photos that Gibbo sent me show the full kit and part of it is installed on Gibbo's mutt. It looks very much like the typical VN armored mutt that we've seen on this board and others. I've never seen an MWO or TB for a kit, but as the kit looks like a proper assembly and not a bubba product, I'm beginning to think that there must be some form of assembly-installation instruction sheet somewhere. Let's hope TACOM can help. Well I still stick to my guns on the fact that there were no kits for Vietnam vehicles. They may have come out later but it wiould not be correct on an A1. May not even fit an A1 without modifications. More pictures! It wasn't until the U. S. Army was involved in Vietnam that the necessity of armor for the M151 series became apparent. During WWII there had been half-hearted attempts to produce a 1/4-ton vehicle that included armor protection. But, even using minimum weight materials the chassis still seemed to always be overloaded; leading to poor handling and shortened vehicle life. With the intensity of the Vietnam conflict increasing, the call for an armored vehicle (particularly from the Military Police) put development back on the priority list. The first vehicles to receive up-armoring were the base M151. By Vietnam many of these vehicles were already over six years old (with a projected 12 year life). Out of desperation modifications were made in the field. Just like later in Iraq, scrap armor or just steel plate and ingenuity produced the first rudimentary protection. The vehicle that would see the most change in protection was the M151A1. Besides the improvised protection there were two armored kits officially developed for the vehicle. The first looked very much like the improvised vehicles, with a simple armor plate in front of the passengers, and a crew compartment enclosed in a box. The second armor kit was better thought out, with opening doors as standard, higher plates around the front and sides, and even more important armor glass 2.5 inches thick fitted so the crew didn't have to expose their heads and shoulders. Catching the end of the Vietnam War, the M151A2 series seem to have only been equipped with the last official version of the armored kit, that is .25 inch armor plate and the armored glass windows. With the end of US involvement in the conflict, the kits were soon removed from any surviving vehicles except for the few on display in museums. It would appear that Ralph's pictures above illustrate all three types, the first kit, improvised locally, and the second kit. You may be right Jim but if you notice the second and third pictures, the side plate on the back is different and the hinges are different on the doors. The second pic shows the armor inside the body rail and the third shows the armor flush with the outside of the body. Definitely not the same setups.